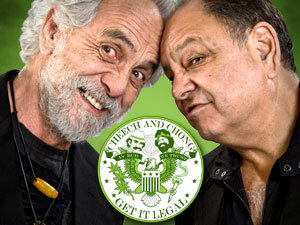 The Wrap tested Tommy Chong's memories of Up in Smoke. In December 2003, we bought live spots on the Howard Stern Show. The band Staind was in the studio along with AVN's Paul Fishbein. Aaron Lewis talks about smoking a joint with Cheech and says Cheech Marin could only smoke up when his wife wasn't around. Tommy Chong and Tara Reid presented a skit in which Reid vaped in a bed and pretended to be stoned, while giving the Sleeping Beauty Award to cannabis beauty company Beboe (founded by Lake Bell’s husband Scott Campbell).